PRDC staff were pleased to attend an American Academy of Pediatric Dentistry (AAPD) webinar on what it takes to ensure that the water flowing through those narrow tubes in dental operatories is safe. Headlines in California and Georgia about multiple children being hospitalized because of abscesses caused by bacteria they picked up from water at their dentists’ offices. 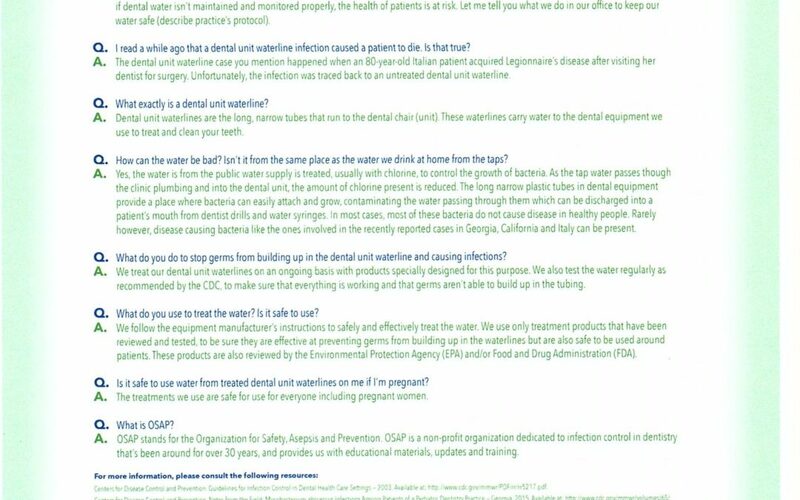 The CDC in the past six months has issued recommendations about ‘dental water asepsis’ aka safe dental water. Children and the elderly seem particularly susceptible to complications from dental water bacterium. But no matter how you look at it, no one wants their mouth irrigated with scummy water. PRDC, with support from the Culpeper Wellness Foundation, has modified all the water lines in all nine operatories to dispense continuous chemical decontamination (tasteless but effective) which will guarantee that harmful bacteria don’t live in our water systems. This type of decontamination is one of the methods recommended by the CDC. 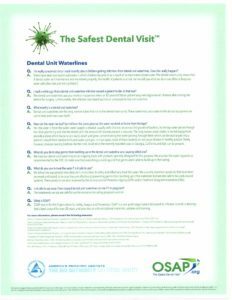 The attached flyer from AAPD and the Organization for Asepsis, Safety and Prevention (OASP) provides background and details. If you have any questions, please ask your dentist next time you visit PRDC!